The Yorkshire Agricultural Society’s educational programme includes a variety of events which are detailed below. We offer exciting hands-on learning opportunities for school children, teachers and families around farming, food, healthy living and the countryside. To deliver our programme we rely on volunteers and exhibitors who can support our events and deliver exceptional learning opportunities. If you are interested in helping or working at our events, please read the information on this page and register your interest via the contact form. Some volunteers help once a year and some can only help at weekends but any time you can spare is hugely appreciated. You may have relevant skills or knowledge associated with farming, food or the countryside and are happy to run an activity for children, or you may prefer to help in the background or direct visitors around the event. All our volunteers are valuable to us and we couldn’t do it without them. A general volunteer may help with directing groups around the site at an event, registering schools when they arrive, handing out leaflets or stickers or being part of the information point team. Do you or have you worked in agricultural and could pass on your knowledge to the next generation. You may inspire their future career, simply teach them where their food comes from or explain how a combine harvester works. If you have expertise in any aspect of farming, food or the countryside we would love to hear from you. Volunteering for us is a fun and fulfilling way to meet Corporate Social Responsibility (CSR) requirements. Your employees will have an enjoyable day whilst helping school children make memories of what most of them say is the best school trip they have ever been on! Do you run educational workshops associated with farming, food, the countryside or healthy living? We would love to hear from you if you can run activities which engage children through delivering exceptional learning opportunities in a hands-on and interactive way. Workshop Providers/Educational Exhibitors are asked to have Public Liability insurance and provide a Risk Assessment for their activity, which we can help you with if necessary. Could you host a farm visit from a school? Could you speak to a group of children and show them how their food is grown or produced on a farm and ends up on their plate? Please get in touch and let us know where you are located and what type of farm you have. We would look after all the arrangements and help on the day as much as you need. We offer a variety of free outdoor learning courses for teachers every term. If you are an experienced trainer and can give teachers the skills they need to feel confident in teaching in the outdoors, please get in touch. Springtime Live is our family event with lots of free activities, farm animals and live entertainment from Mr Bloom. Countryside Days welcomes over 6000 Primary school children from across Yorkshire in KS2 (7-11yrs) to the Great Yorkshire Showground to learn all about Farming, Food and the Countryside. The Discovery Zone at the Great Yorkshire Show provides ‘hands-on’ interactive learning opportunities for all the family and school groups. The Yorkshire Agricultural Society host a land-based careers zone, within this event where local companies can showcase their careers to the next generation. The Create & Explore area is the perfect place for children to have-a-go and get involved with lots of exciting workshops. 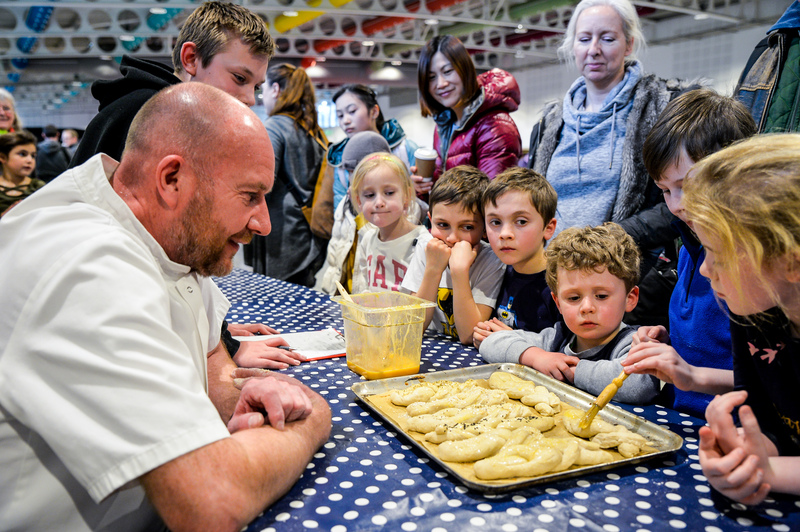 Experience Days which have included Apple Day, Farmhouse Breakfast and Potato Days, are smaller events which we either hold at the showground or on farms and invite schools to learn more about the farm to fork journey of food.